The legend of those mysterious Google barges is half over, and Google definitely didn't get the ending that it wanted for this one. 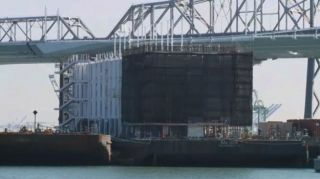 While the barge floating near San Francisco remains, the other one, which is currently floating in a Portland, Maine harbor, has been sold. An unnamed "international barging company" will steer the ship seaward and disassemble its containers for scrap, according to the Portland Press Herald. Wonder which of Google's other bad ideas the company will discard next? TechRadar's blips are still afloat - read more here!